Former Los Altos HC Dale Ziola has joined the Arroyo staff as receivers Coach after much speculation. (El Monte) – For the last two years everybody in the local high school football circles have speculated where Dale Ziola will coach. Without keeping everybody in further suspense, Ziola has joined Jim Singiser’s staff at Arroyo where he will coach receivers. “Jim (Singiser) does a great job here and runs a great program. We’ve been talking for awhile and when I got a chance to come over and see what he has I decided to come. I’ve been out here since spring and it’s been great,” Ziola said Saturday morning at the Arroyo Linemen competition. When Ziola stepped down as the head coach at Los Altos after the 2016 campaign, rumors had him landing everywhere from West Covina to La Mirada to Diamond Bar. 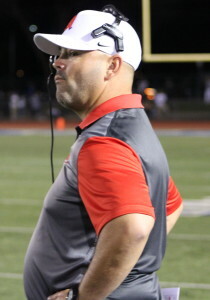 Well last year he did go to Diamond Bar, where he was an assistant coach under former Los Altos assistant Kevin Argumosa, who took over as head coach of the Brahmas. But Argumosa was dismissed after an 0-10 2017 season, the staff was disbanded and Ziola was on the market again. Of course the need for a coach who took a team to two CIF title games in a three-year span as Ziola did with Los Altos wasn’t unexpected. If you’ve read this site or possibly Freddy Robledo’s over at the Trib you’ve noticed all of the coaching changes that have taken place since the season ended in early December. And Ziola had been mentioned to fill a majority of them. Fullerton was a hot spot when it opened up but that was filled by Richard Salazar who left Nogales to take the head coaching position. Nogales was then a possibility but they decided on former Workman HC Oscar Robles who left the Lobos after just one year. The scoop was then that Ziola would take over at Workman as possibly both AD and HC. None of those scenarios became a reality. And when the 2018 season comes to an end, and the annual coaching openings start popping up, Ziola’s name will be out there again. 12 Comments to "Ziola Will Coach at…Arroyo"
“stuff they do behind the scenes” How about some facts to back up your statement. I’ll wait to read your expose. Captain…there’s plenty of ways to skim off the top. Remember their football camp last year? Those are cash cows. I heard EM’s new toy is a beast. The facts remain, can he run over Arroyo and win them a league title? If he’s legit, can Arroyo stop their one trick pony offense? Is EM’s defense good enough to stop Arroyo from scoring early and often? Can this young man accumulate yards behind his big but soft line? Mid Valley should look into.. Have it on good standing that Spathias was announced as HC at Workman today. You gotta give it to Singiser on this. To convince a former head coach to come in and help is gonna elevate all the coaches on staff. Everybody’s gotta get better. It would be easy to sit back and relax because the knights have dominated league play for years, but this points to Singiser accepting the challenge of being promoted up a few divisions and to continue the success the program has seen in recent years. Kudos to the Arroyo program for this hire. On a side note, I hear the EM Running back is the real deal. There’s a new horse in the MVL. Now, Arroyo is used to facing stud runners because of the playoff run as well as the graduated Sal Tovar, So maybe the game plan is already laid out. But if what I’m hearing is true …. yikes! We could see a 2000 yard rusher this season! Any word if Spathaias is on anybody staff? Los Altos is Bad. Have you been to Amat. They have The most Arrogant Smack talking Parent’s around. Amat is even worse that Ghetto St. Paul. How does Arroyo hire so many coaches? Or do these people volunteer? I agree 100%, Los Altos worst combo of AD & ghetto parents in the valley!!! This shows me that Dale always wanted to coach, but not at Los Altos. Why? Is it because he didn’t trust the administration? Is it because he hated the ghetto parents that the administration would listen to? Is it because the players are entitled brats? Is it because he didn’t want to go through a rebuilding year or two? I think all of the above. HC jobs getting tougher to get for coaches trying to make a come back.